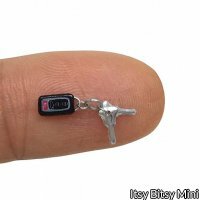 This tiny dollhouse miniature key chain is ready to be displayed on a kitchen counter or hanging on a hook. The car fob is just 3 mm width X 5 mm in length X 1 mm height. Included also are also 2 metal keys that are 6 mm long. It is highly detailed made from many individual metal pieces just like the life-size version. The individual lock, unlock and alarm buttons are readable under magnification. The key chain would look adorable paired with our smart phone or sunglasses (sold separately). One inch scale 1:12.